With a population estimated at around 300 individuals, the northern right whale is “the most endangered species.” And unfortunately, they appear to be in very serious trouble. Once they were fairly abundant, but this creature’s first bit of bad luck was to be designated as the “right” whale by the early whalers...meaning "right" to kill. Apparently it moves more slowly than other whales and conveniently floats after death - sinking whale corpses presented a real problem to the early whalers. 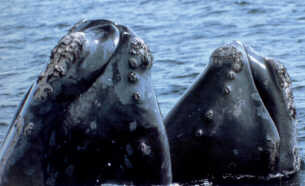 Because of this, the right whale suffered heavy losses from “whaling pressure” earlier than most. 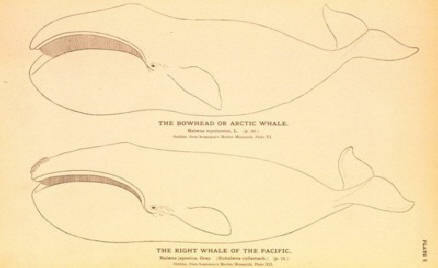 The right whale was relatively rare even a century ago. The northern right whale has been protected by an international agreement since 1935. Since that time the population has failed to grow significantly, in fact it now appears to be in further decline. (Population: approximately 300 whales) It is very disappointing to see this rare animal fail to increase it’s numbers despite our best efforts to “protect” it. In the last decade considerable effort has been put into trying to “save” the right whale. Collisions with ships are believed to be one of the major threats facing these whales, so systematic aerial surveys are done to determine where the whales are swimming and then shipping traffic is warned to stay clear of them. This is probably a worthwhile venture, but will never be enough. The crew of the survey planes keep good records of dates and numbers, and write up reports which are posted on the internet. (http://whale.wheelock.edu/whalenet-stuff/reports/ ) They have sighted very few calves in the past few years, and considering how few calves they see, it is actually not uncommon for them to report dead ones (causes of death for the calves have been unclear - usually not “ship-strikes” or “entanglement in fishing gear”). "What" is killing the right whale calves? It is not understood, and it is not all down to "pollution." Living conditions in the ocean are all but impossible for the northern right whale today. I believe these whales are suffering badly from starvation, and have been doing so for a long time. If you look for other large specialized plankton feeders for comparison, for example the whale shark and the basking shark, where do you find them?...beside the right whale...on the endangered species lists... These are all pieces of the puzzle that make up the picture of the STARVING MARINE ECOSYSTEM.